Frittatas are always the answer to “what do I do with this (half a zucchini, handful of sautéed mushrooms, bell pepper that’s a bit squishy, cup of cooked rice, etc)”. Use this recipe as a template to create your own frittata creations, adding a combination of your favorite vegetables, herbs, and meats. Other answers to these using-up-the-leftover problems can be found in the form of fried rice and quesadillas. They're the perfect solution to making a simple meal while clearing the fridge. A win-win. Preheat the broiler. Heat an 8 to 10-inch skillet over medium high heat. Add 1 tablespoon of the oil and the butter. Add the shallots and the mushrooms, and sauté for about 8 minutes until they have become fairly tender. Add the peppers and sauté for 2 more minutes until all of the vegetables have become tender. Stir in the thyme. Meanwhile beat the eggs in a medium bowl. Add them to the pan, stirring frequently for two minutes. Sprinkle cheese on top. Lower the heat to medium low and cook for 2 to 3 minutes until the eggs are set on the bottom. Transfer to the broiler and broil for 1 to 2 minutes until the top is set and the cheese is melted and golden and the frittata is lightly puffed. There is always at least one optional ingredient in a frittata (vegetables, and such ingredients are combined with the beaten egg mixture while the eggs are still raw rather than being laid over the mostly cooked egg mixture before it is folded, as in a conventional omelette). Eggs for frittata may be beaten vigorously, to incorporate more air than traditional savory omelettes, to allow a deeper filling and a fluffier result. The mixture is cooked over a very low heat, more slowly than an omelette, for at least 5 minutes, typically 15, until the underside is set but the top is still runny. 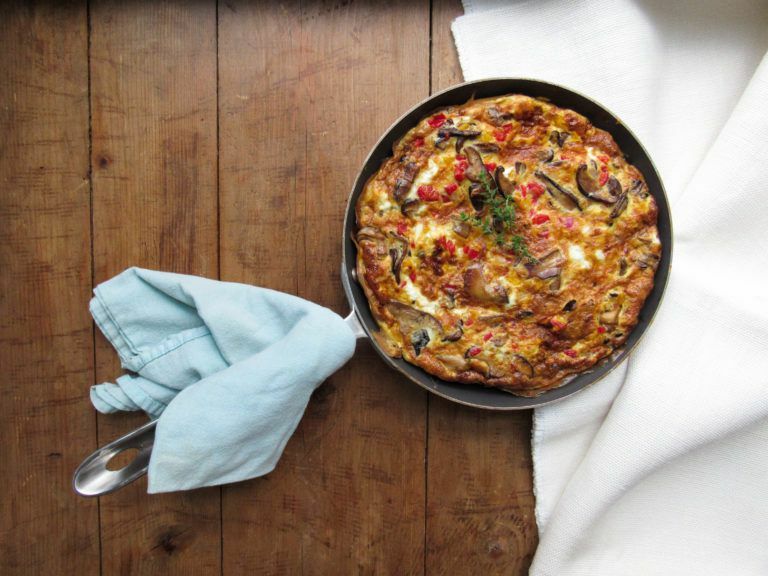 The partly cooked frittata is not folded to enclose its contents, like an omelette, but it is instead either turned over in full, or briefly broiled to set the top layer, or baked for around five minutes.